Ask anyone you know if they love to travel and the responses you get will lean more towards an overwhelming ‘Yes!’. The thing is though, we are all different types of travellers who approach the same destination in totally different ways. There are soul searchers whose aim is to find themselves; sticklers who’ll religiously stick to their regular routine despite the fact they are on vacation. Groupies can’t understand why anyone would travel alone, while the ubiquitous city slicker can’t spend an hour away from the hustle and bustle of urban life. Everyone knows the history buff who can’t seem to quench his thirst for the ancient. And then the resort hopper, to whom sightseeing, shopping or doing anything new is clearly not their game and would rather chill out in some plush resort with a constant booze supply. We, travellers, are truly a diverse breed. It’s common to hear people say a destination has something for everyone. But allow me to burst your bubble with regard to Bosnia Herzegovina. This one does not. For it is very niche. But in a splendid historical sort of way. If you are adventurous, historic, artistic, nature-devoted, beach-loving and open-minded – You. Will. Love. It. Bosnia Herzegovina has something that is not just hard to find anywhere in the world, but also impossible to mimic. It’s a country with a certain ‘foible’ to it. Because from the moment you set foot on this land, it offers this time-warped experience that makes you feel as if you’ve gone back in time (in an awesome way). The air feels fresher, people drive at a slower pace (not the irritating slow), and it’s impossible to instantly resist the urge to appreciate the simpler things in life. It’s different. It’s historical. It’s picturesque. The sheer beauty of it will just take you aback. 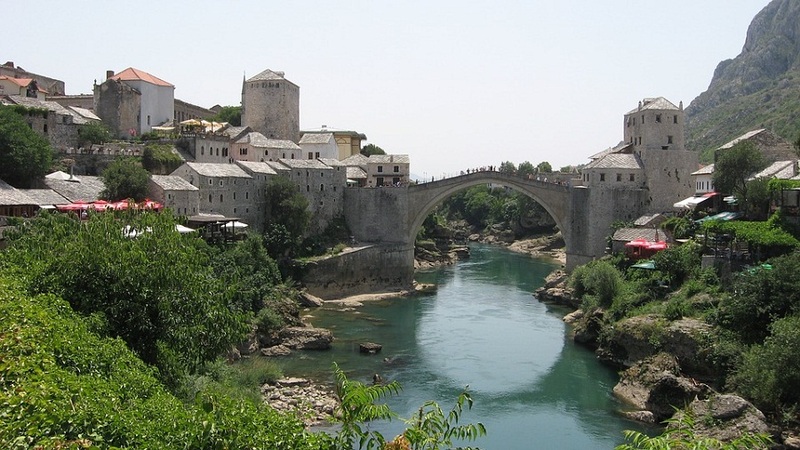 Here then, are the 20 things to do in Bosnia Herzegovina! Bosnia and history are like conjoined twins. You can’t talk about one and leave out the other. One of the best places to get a taste of this history is the Old Town in Sarajevo, the capital of Bosnia. If you’ve been fortunate enough to see a few old towns in your life, wait until you get here. One of its highlights is the Sebilj Fountain, an unusually-designed fountain built in 1891 and sits in the city square. Back then, a man would quench the thirst of the weary free of charge by scooping water from the trough, ideals that carry on to this day (although tin place of the man are ever-flowing taps). Just adjacent to the fountain is another symbol of the Old Town: pigeons. You are free to feed them as long as you source the bird feed from the sellers nearby for 1 Bosnian mark. Anyone who was growing up in the ‘90s would most likely have heard the name Bosnia a lot on the news. 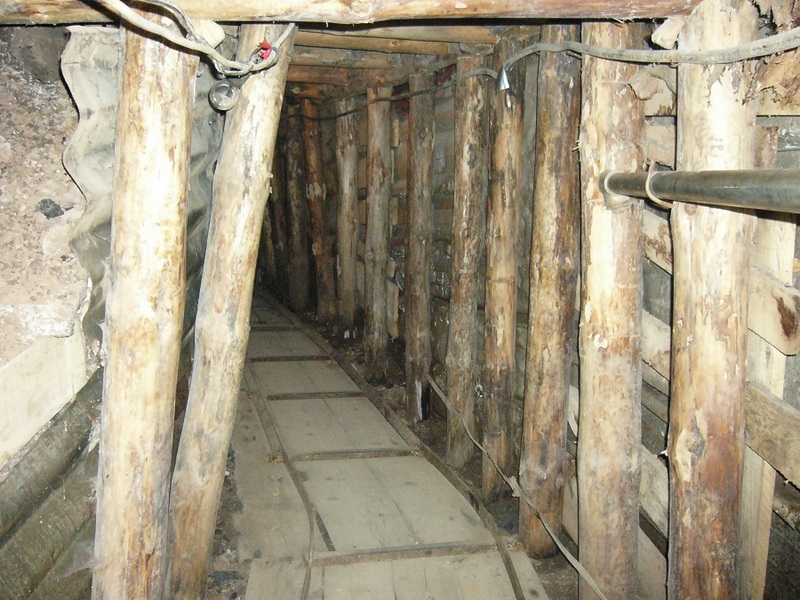 The Tunnel of Life is a tunnel that was constructed during the Balkan Wars (Serbs versus Bosnians, Croats and Albanians) of the late 20th century and used to ferry machine guns, crates of ammunition and about 20 million tons of food into the country, thus helping the lesser armed Bosnian army defend itself during a four-year siege. Hailed as the tunnel that saved Bosnia, it was dug by hand by a man, his wife and an estimated 200 soldiers, burrowing through almost 2,500 feet of soil, working in 8-hour shifts. It’s a must-see. Srebrenica was the scene of one of the most horrific mass murders since World War II. Apparently, it was supposed to be a UN safe haven during the Bosnian War. Located in the Tunnel Museum, today the gallery tells the story of the genocide through the eyes of those who lived to experience it, and also doubles up as a memorial to the thousands who died. This place just brings history to life. The peak of Maglic is the highest point in Bosnia, although not the largest mountain. 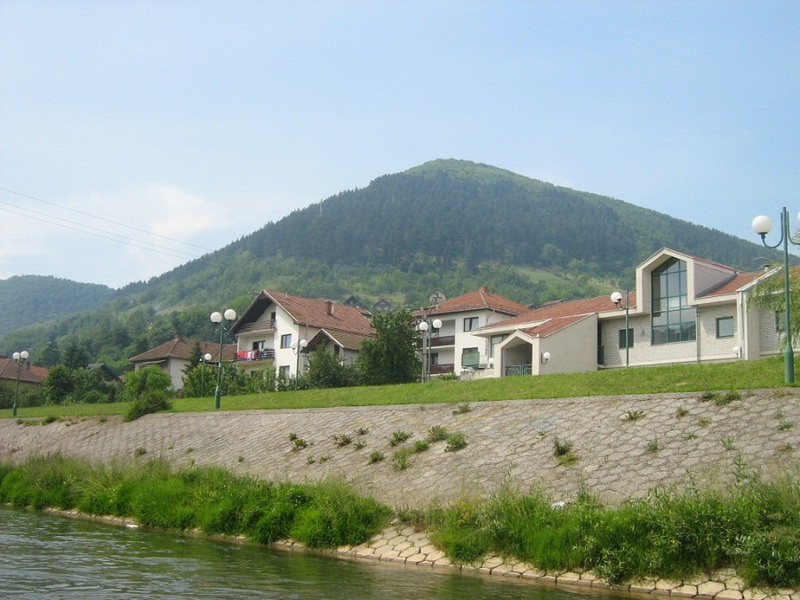 Actually, the mountain has two peaks: one on the Bosnian side (standing at 2,386 metres above sea level), and the other on the bordering Montenegro (2 metres higher). Christened the Misty Mountain, it lives up to its billing even in summer (flowers are in full bloom at this time BTW) so you can expect some fog. Expectedly, the panoramic views from the peak are jaw-dropping, if you’re lucky to miss the mist. You can sight the neighbouring mountains of Volujak (2294 m) and Bioc (2397 m), and also Durmitor in Montenegro. Squeezed in between Maglic, Volujak and Biok is Trnovacko Lake, a splendid blue-green lake that serves to accentuate the view that will forever be etched in memory. Read our reviews of the best hydration backpacks if you are attempting the peaks! Art lovers will particularly appreciate the architecture on display in Sarajevo’s Town Hall which is one of the most remarkable Austro-Hungarian architecture you’ll come across. So remarkable that a local joke often goes that the impact made by the Austro-Hungarians in the city in just 50 years the Ottomans found hard to replicate in 500. Situated just opposite the Town Hall, and separated by a river, is the House of Spite, a traditional restaurant that serves Bosnian cuisine made from quality organic products. This is just the place to go if you want to try out the best the local cuisine has to offer. Once a house owned by a man named Benderija, the now protected historical and cultural heritage site has a really interesting story behind it. It was as recent as 2005 that archeologist Dr Sam Osmanagich discovered the Pyramid of the Sun in Bosnia, a name given to Visocica hill near the Old Town of Visoko. The discovery has elicited much debate in archaeological circles. While some have dismissed the idea, others consider it a pyramid based on the shape (and the underground tunnel labyrinth, complete with ancient mortar and stone blocks unearthed nearby). It is believed that this will be the largest and oldest man-made pyramid as it dwarfs the Great Pyramid of Egypt by as much as 73 metres. The Perucica forest is the closest you’ll get to a rainforest in Europe. This is one of the last remaining primeval forests in the entire Europe. Accessible from the Sutjeska National Park, a hike through the heart of the forest is an awe-inspiring experience. Kravice (Kravica) is a stunning waterfall found on the Trebizat River. It includes a series of 20 or so falls, pounding dramatically on a small lake sitting 25 metres below. Entry is free, and you are free to wander anywhere. Svrzo’s House is an 18th century house-museum that shines a light on the lifestyle of a wealthy Muslim family when the Ottoman Empire reigned supreme. It’s made of a partly vine-draped timber (a not-so-common construction material then) with white-washed walls. The serene courtyard is paved with cobblestone and provides for a pleasant, private sitting area now used by visitors. 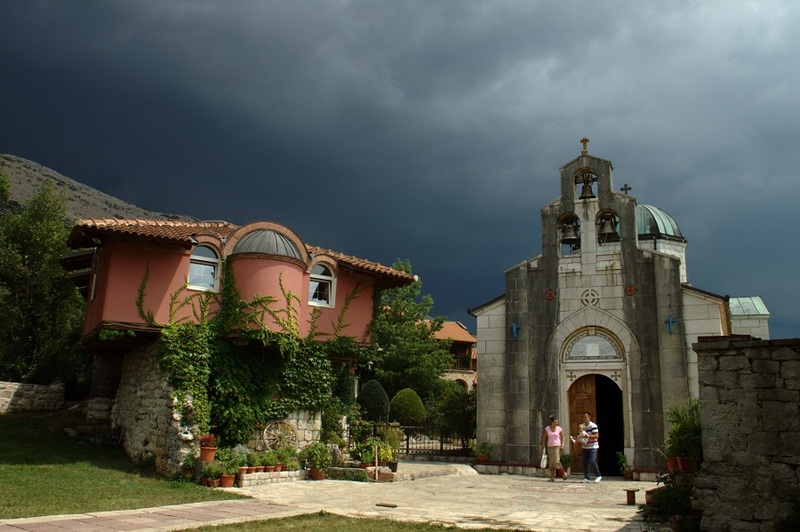 Tracing its roots back to the Middle Ages, the Tvrdoš Monastery was constructed on the foundations of an old church. It was founded by the Czar, Saint Constantine and Saint Helen, his mother, before being annihilated and at some point becoming the endowment of Serbian King Milulian. Wine lovers, you haven’t been to Bosnia if you haven’t docked at this amazing port of call. It has two wine cellars, one recent, another dating back to the 15th century and made of stone. 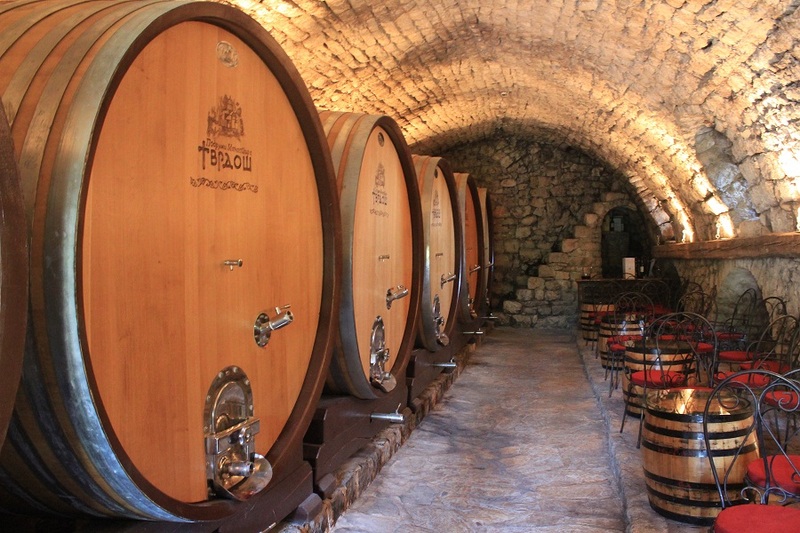 It boasts some of the largest barrels you’ve seen – over a hundred years old – used to age the Vranac grape, one of the brands, along with Zilawka. You can also find some familiar tastes in Chardonnay, Merlot, Syrah and Cabernet Sauvignon. The Buna River is a perfect example of an underground karst river, emanating from a 200-metre cliff wall and singlehandedly the reason the river exists. This natural pearl is the largest karst (and most stunning) spring in Europe. It remains one of the most mystical locations in the country. Located in the Dinaric Alps, Jahorina is a mountain range that guarantees 3 to 4 months of amazing ski snow. Its highest peak stands at 1,910 metres, with the ski lifts climbing to 1,894 metres, providing splendid views of the pine-covered slopes. Pliva is a historical and cultural heritage whose value is a natural rarity. The limestone bosom below quietly leaks an abundant water supply that gains in speed the further from the source it goes, before finally emerging as a roaring river soaked with white foam. It’s a great picnic site with the fragrance of flowers permeating the air which feels so naturally fresh. If that isn’t fun, get plenty of dry fly action with a plethora of species to choose from, including huge grayling and black knights. Of course, a holiday to such a history-rich country as Bosnia Herzegovina isn’t complete without a visit to a national park. Sutjeska is the largest and oldest in the country with plenty of attractions on offer: from the natural flora and attractions such as bubbling rapids, to the camping sites, shepherd’s villages, lodges and pavilions, and activities like rafting, hiking, and biking, it’s a treat. Dedicated to the nativity of the Theotokos, no Serbian Orthodox church in Sarajevo comes close to this one in terms of size. If you want to experience the allures and challenges of a karst, the Trebišnjica River is the place to go. For this is the ideal example of a sinking river that sinks and reappears at multiple locations and in multiple countries, covering a total length of 187 kilometres above and under the ground. Stari Most used to be known as the Old Bridge before 1993 when it was destroyed by heavy artillery fire, having stood for a staggering 429 years. Completed in 1564 following 9 years of construction, it served as an example of advanced technology before its time, even becoming a world heritage site. So treasured was it that it was only befitting that a clone be built, using as much white limestone from the original as could be salvaged. 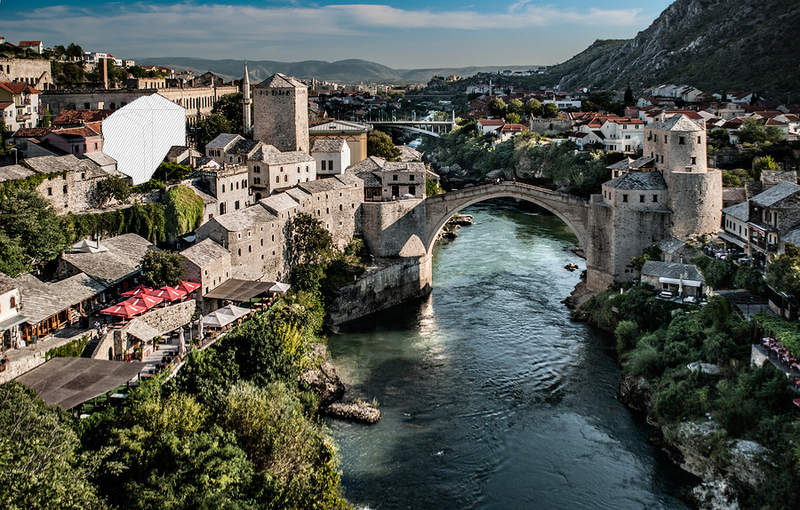 Inherited from six historical civilisations, the region of Bosnia is an architectural marvel. From castles and fortresses to monasteries, underground churches, catacombs, Jewish heritage sites and other attractions, the architectural range of this country just leaves you breathless. The most intriguing thing about Bosnia Herzegovina is that it’s such a small country that’s endowed with just about everything. It’s also home to great sandy beaches which you’ll find aplenty in the town of Neum. Truly, Bosnia Herzegovina is testament that great things indeed come in small packages. It’s a jewel; the world in one place.